I teach a class called Spiritual Practices of the East at an international school in Hong Kong. It is for juniors or seniors at the High School level. It’s main focus is meditation and includes both the neuroscience of meditation and the study of Wisdom Teachers who have promoted meditation throughout the ages. This blog post is the first of several I will write for the class and I have copied it here with minor alterations. Students have added insightful comments to the class blog which are not included in this public version. The I Ching hexagrams we got in class in response to our question “how should we proceed with learning about spiritual practices?” indicated we should take a risk with meditation. What sort of risk does this imply? I think it implies taking the risk of finding out what we are really like inside. What motivates me? What triggers my negative emotions? Do I manage to observe them arising and keep them from taking over? Can I cultivate positive emotions, positive attitudes? What Pema Chodron is talking about is “feeding the good wolf” – from the illustration in class today of the Cherokee Indian grandfather’s story told to his grandson. When, in meditation, we notice negative thoughts arising how do we deal with them? We can cut them off – as in ‘let go’ of them as soon as we notice them. Or, as Pema suggests, we can confront them. Sometimes it is better to confront them instead of letting them go because once we face them, acknowledge them, we can experience them in a new, aware way. Instead of running away from them or trying to deny them, we will see them for what they really are and they will cease to hold any power over us. Instead of cultivating these negative emotions we can train ourselves to cultivate positive aspirations such as compassion – like the bodhisattva vow which says we should strive for the freedom from suffering for all beings as we strive for our own freedom. Since writing the above for the class I have had further thoughts. 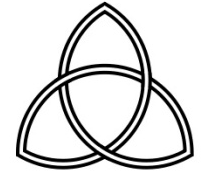 Cynthia Bourgeault‘s new book, The Holy Trinity and the Law of Three, suggests a third factor – a reconciling or mediating force. I have not completely digested this book yet but I think I get the general principle of the law of three. What Pema Chodron suggests is this third way – or from a Buddhist perspective, a middle way – of dealing with thoughts and feelings. 1) We can let them take over our minds and emotions; 2) we can cut them off, suppress or deny them; or 3) we can confront or reconcile them – actually acknowledging them as they are while seeing where they come from. The third way frees us from their power over us. By doing this we can “soften” our fears and replace them with aspirations for freedom from suffering in ourselves and in all others. This naturally cultivates the capacity for compassion.